iPhone has gained a reputation for being one of the most reliable devices in the world. However, iPhone is sometimes prone to go into glitches and bugs. Among them, iPhone stuck on loading screen, is actually a typical issue reported by numerous users. This is where the iPhone is stalled on a black or white loading screen, which can be very frustrating since it's much unexpected on an iPhone. Luckily for you, this problem is usually fairly easy to solve. Explore the options below and find the best one for you. 1. A hardware malfunction: hardware issues on iPhones are mostly caused by mishandling your iPhone and breaking one of the components inside. Hardware issues are rarely the fault of Apple. Such issues mostly occur if your iPhone has suffered a hard fall, or been exposed to extreme heat or moisture. 2. Software viruses: system viruses can be the cause of this unfortunate event. Apple operating systems are very resistant to software viruses. However, there are determined hackers that send viruses through malicious websites. Your iPhone might have a virus that is causing it to stall. 3. iOS version Update: a frozen loading screen mostly occurs after you update the iOS version on your iPhone. Sometimes, a new iOS version can cause instability in your iPhone settings leading to a frozen loading screen. 4. Restoring to factory settings: restoring a device back to factory settings is supposed to make something faster. However, you might end up "confusing" your iPhone after you reset to factory setting. Some settings might not be properly reset and this might cause a frozen loading screen. Do not panic if your iPhone stuck on loading screen. There are plenty of solutions that you can use to take care of the issue. This method is popularly well-known to fix iOS system issues. A hard reset is supposed to clear the data or settings that are making your phone get stuck during booting. It is pretty easy to perform. If your iPhone is version 6 or lower, follow this process: simultaneously press the power and home buttons > release the buttons once the screen becomes dark> press the power button until the apple logo appears > iPhone should be restarted and continue to work normally. The first step is different if your iPhone is iPhone 7/7 Plus. You should press down the power and volume down buttons. Hold the buttons down until you see the screen go dark. The rest of the process is the same. 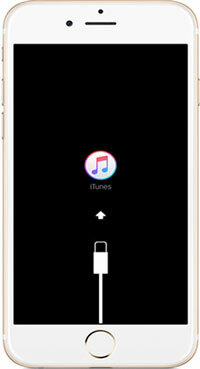 For iPhone 8 or later, follow this process: press the side button and either one of the volume buttons > keep on holding the buttons until the slider appears on the screen > switch off the device > press the side button and keep pressing until you can see the onscreen Apple logo > your device should now run normally. Step 6. After that, use iTunes to restore the iPhone. The above-listed methods of restoring your iPhone are all good methods to use. However, they almost always cause data loss. 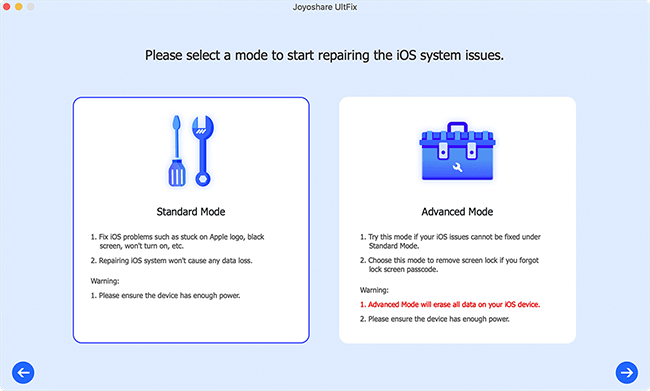 Here Joyoshare UltFix iOS System Recovery is a trustworthy iOS repair tool designed to fix iOS without losing data. It empowers you to instantly enter or exit Recovery Mode with just one click completely free. Additionally, this brilliant program even supports repairing 30+ iOS issues, like iPhone stuck in DFU mode, black screen, iPhone won't restore, iPhone activation error, iPad is disabled connect to iTunes, iPhone bricked, etc. If you need, its advanced mode can also allow you to factory reset iPhone without passcode or iTunes. 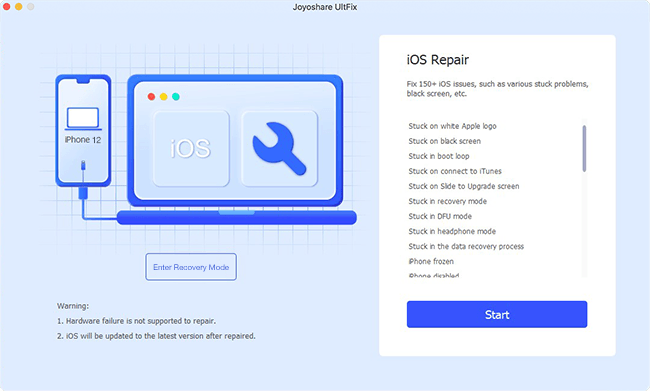 Step 1: Go to official download page to install Joyoshare UltFix iOS System Recovery on your computer. Launch the program and connect iPhone as request. Simply click on "Start" button to go on. Step 2: Select repair mode according to your actual requirement. 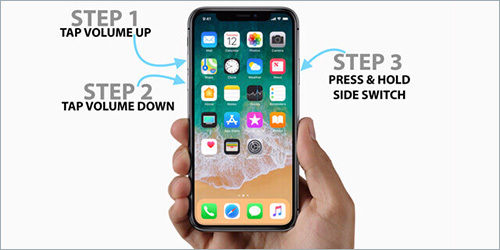 You can either choose the "Standard Mode" to fix your iPhone stuck on loading screen problem with no data loss or use the "Advanced Mode" to repair serious system issues without passcode. Then press on the "Next" button to boot iPhone to Recovery/DFU Mode. Step 3: Having successfully entered DFU/Recovery Mode, you will need to confirm all detected iPhone device info. Next go to download and verify the firmware package with the "Download" button. Step 4: Continue to tap on the "Repair" button to have a confirm and let Joyoshare help you unzip the firmware and fix the iOS, iPhone loading screen system problem. If all the above solutions fail, consider taking your device to an Apple store. The frozen iPhone loading screen might probably be caused by a defective part that only a technician can repair. This is a very safe method of dealing with the frozen loading screen. The Apple technicians will most probably keep your data and still fix your device. However, it can sometimes be very expensive especially if it is a hardware issue. Your iPhone stuck on loading screen is not something that you should be worried too much about. More likely than not, your iPhone can be fixed and go back to normal. Some of methods introduced above will cause data loss. 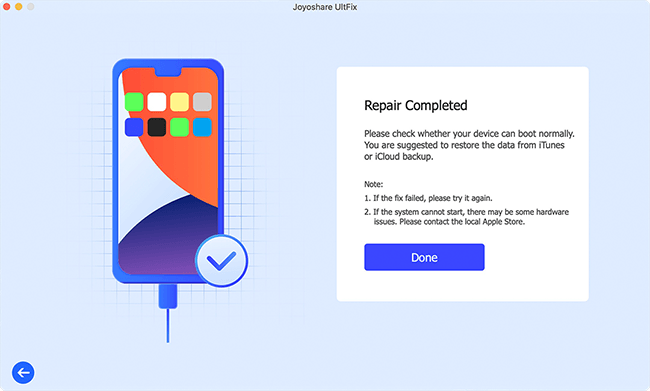 If you are unwilling to restore iPhone, please ask Joyoshare UltFix iOS System Recovery for help, which is easy to operate and efficient to fix iOS with no data loss.